Brazilian crane rental company I.V. Guindastes has purchased a used LR 1600/2-W crawler crane from Liebherr. 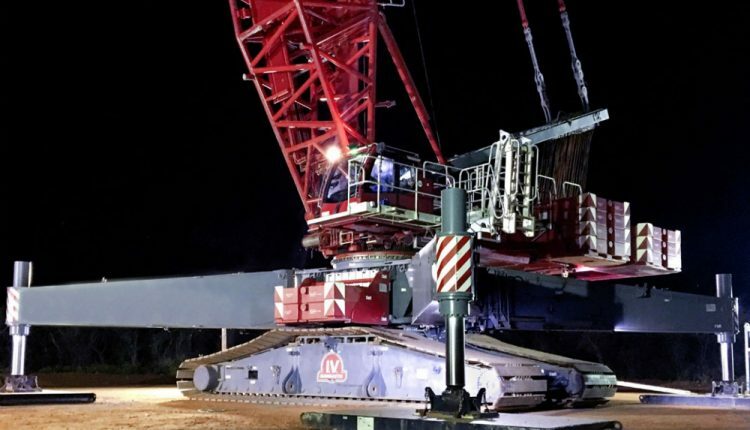 The 600-tonne capacity crane is now erecting wind turbines for Wobben Enercon in João Camara in the Brazilian state of Rio Grande do Norte, where it has lifted a 65 tonne rotor star in a single hoist to a height of 97 m.
After inspecting the mechanical and electrical components of the LR 1600/2-W, which was built in 2012, the crawler crane was completely repainted by I.V. Guindastes, which also purchased two used Liebherr LTM 1100-4.2 mobile cranes earlier this year. I.V. Guindastes’ fleet includes 25 mobile and crawler cranes, 18 of which are Liebherr models.